On August 24th, 1992, a category 5 chainsaw called Hurricane Andrew cut a swath of ruin like no storm before it.More than 28,000 homes were destroyed, 107,000 damaged — a toll that made it the nation’s costliest natural catastrophe until Katrina in 2005. 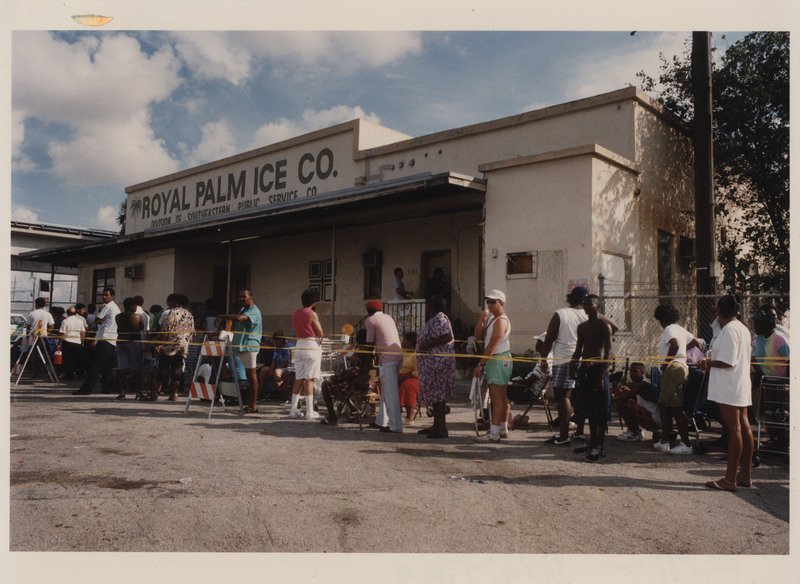 Fifteen people were killed in Miami-Dade alone. Dozens more died in exhausting months of clean-up. 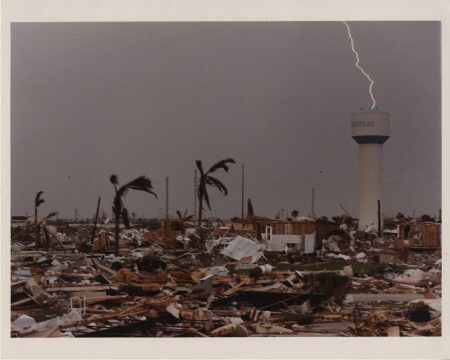 Some 180,000 were left homeless, 1.4 million without power. 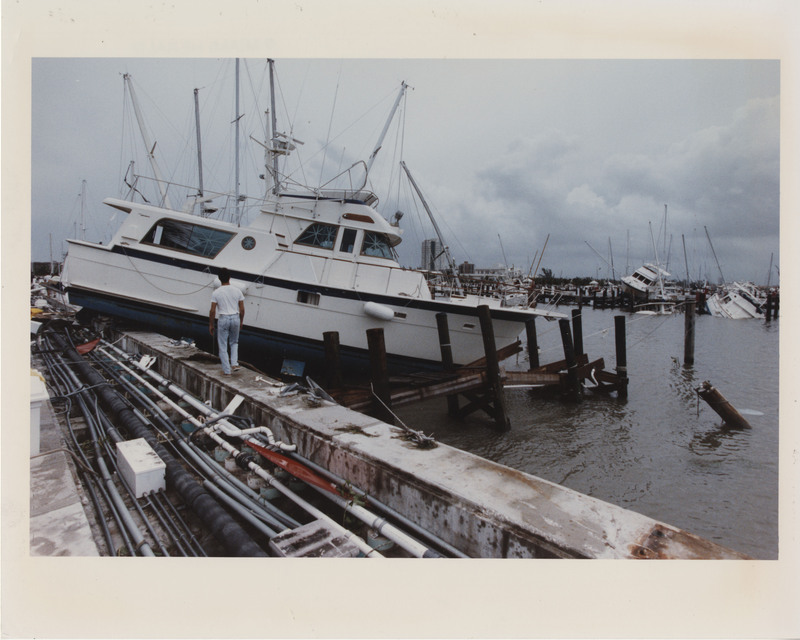 Hurricane Andrew also bulldozed South Florida’s most treasured natural areas. 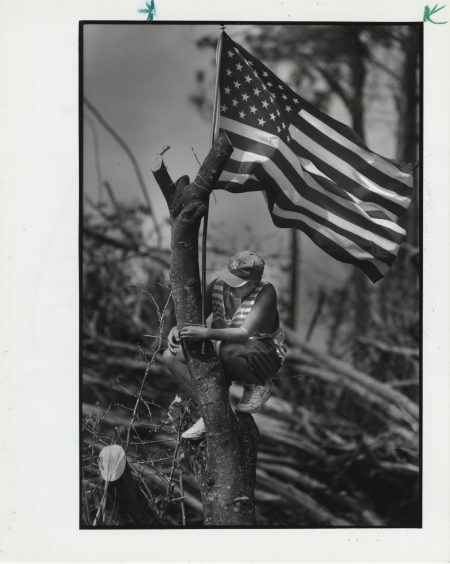 Plowing a 30-mile-wide path, the storm toppled centuries-old coral heads, flattened more than 70,000 acres of mangrove forests, shredded venerable hardwoods in tropical hammocks and pushed Dade’s already imperiled pinelands to the brink of oblivion.The numbers don’t fully explain the impact. South Miami-Dade resembled a post-war zone for one grueling summer — tent cities, food lines, soldiers on patrol, residents packing weapons. Andrew would strengthen building codes but send insurance rates soaring. 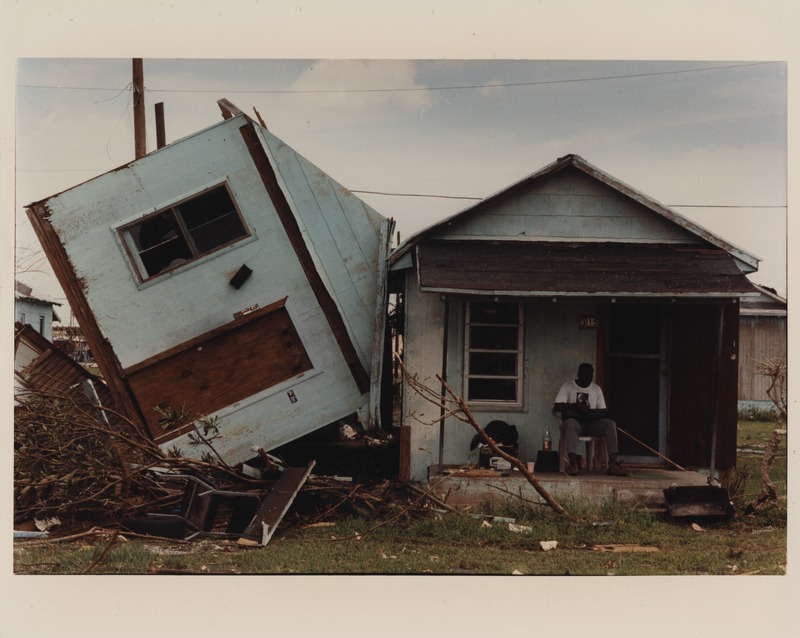 It would force an overhaul of overwhelmed state and federal disaster agencies. 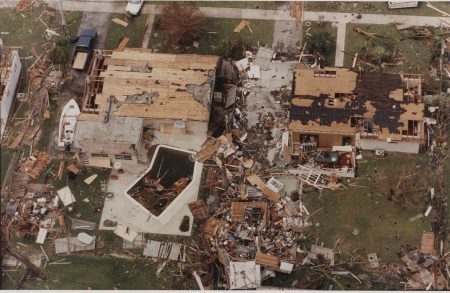 It would fuel a boom in South Broward and flight from ground zero, where stress showed in spikes of divorce, murder and suicide rates. 8/1992, Patrick Farrell/Miami Herald: Sometimes, all the effort gets to be too much: Genesah Duffy, 4, is comforted by her father, Jack. 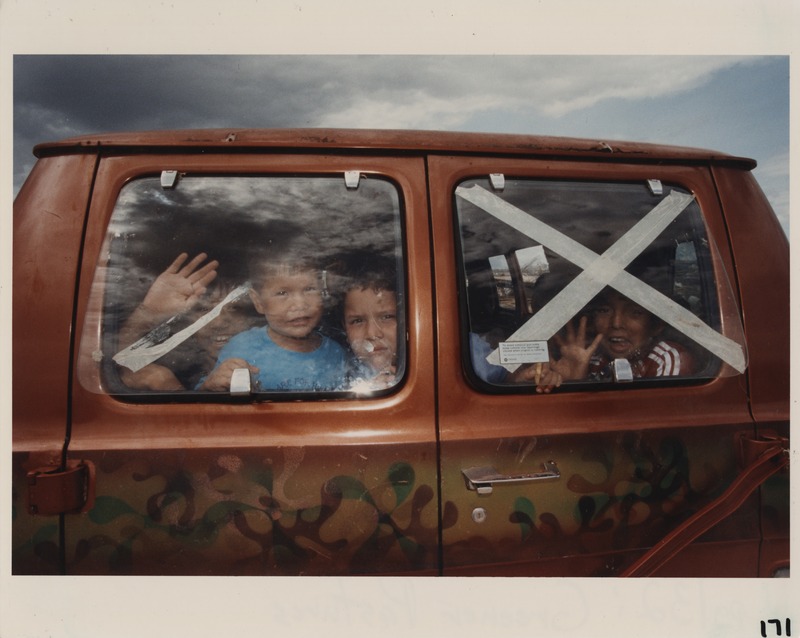 Their family was sleeping in a tent outside their house. 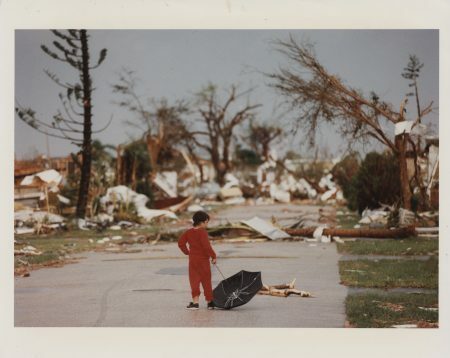 A few days after the storm, local psychiatrists attended a seminar to discuss Andrew's long-term effects on children. 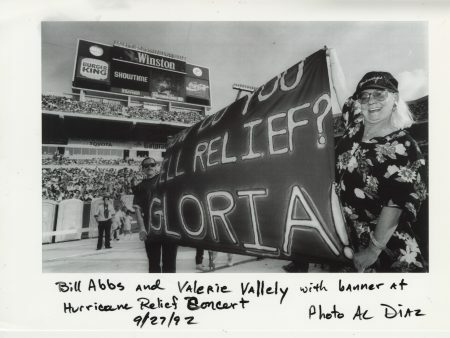 9/27/1992: Al Diaz/Miami Herald Staff -- Bill Abbs and Valerie Vallely with banner at Hurricane Relief Concert in Joe Robbie Stadium. "How do you spell relief: GLORIA!" 8/1992, Marice Cohn Band/Miami Herald: Waiting, Desperate for anything to keep food cool, people line up for blocks to get ice on South Dixie Highway. It could take two hours to reach the front of the line. 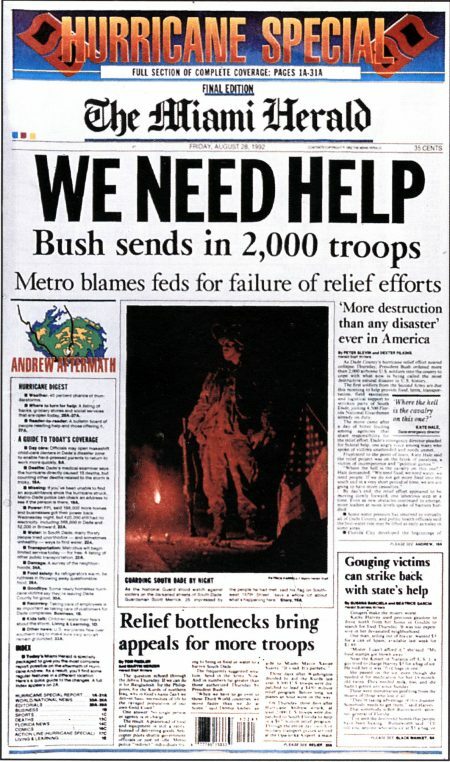 8/1992, C.W. 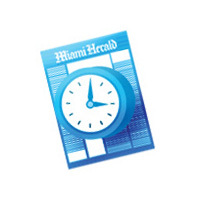 Griffin/Miami Herald: James Dukes Jr. holds his pet hamster. The soaked hamster survived the storm, but died a couple of days after this photo was taken. 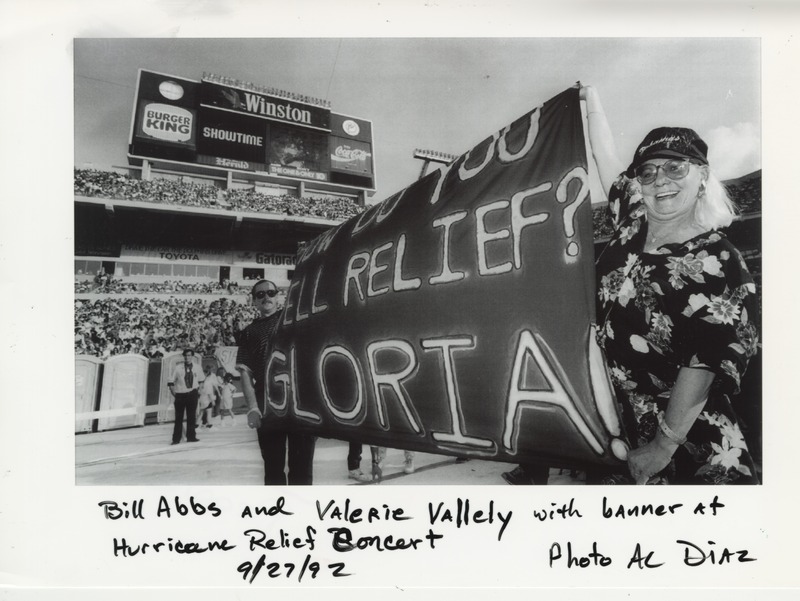 9/27/1992, Al Diaz/Miami Herald Staff: Bill Abbs and Valerie Vallely with banner at Hurricane Relief Concert in Joe Robbie Stadium. 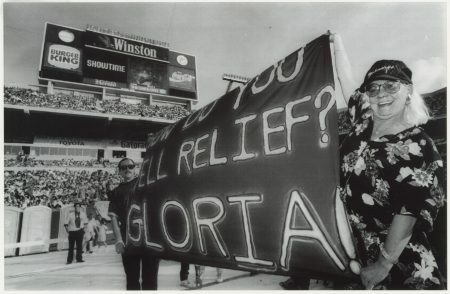 "How do you spell relief: GLORIA!" 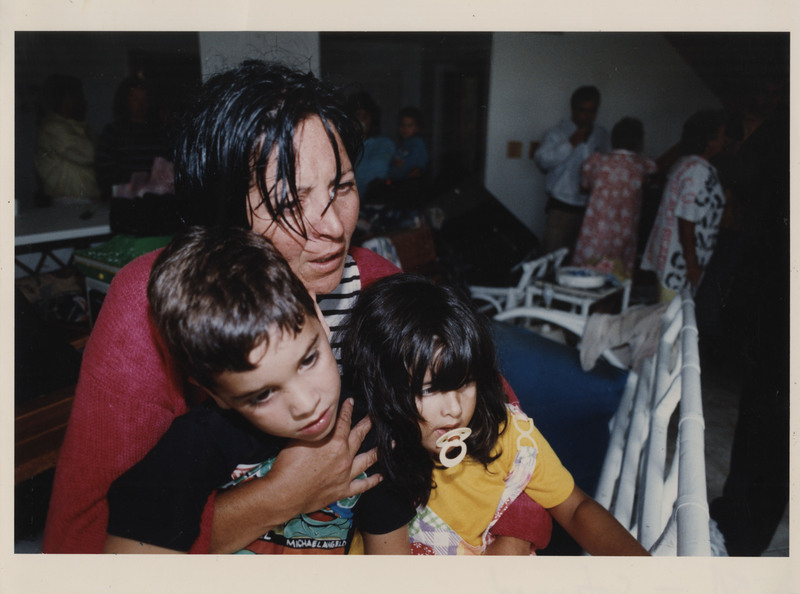 1992, Angelene Valentin/Miami Herald: "True native. We will rebuild." 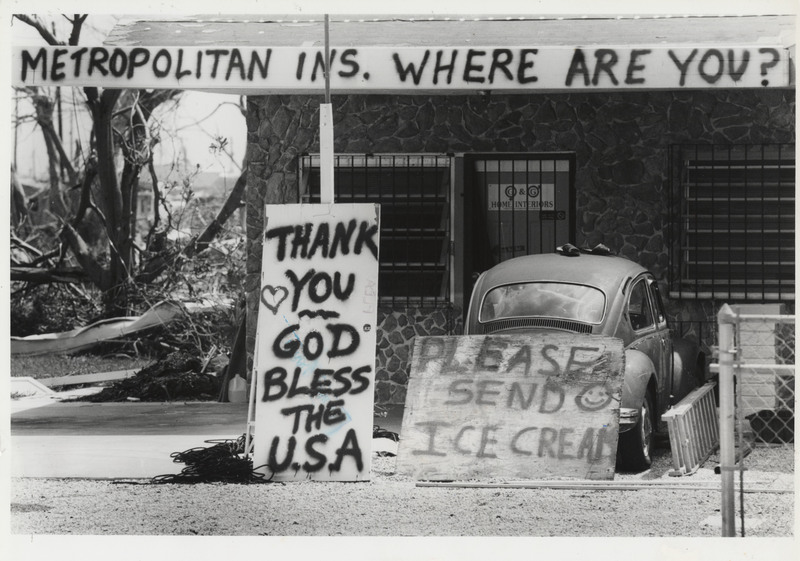 Rebuilding after Hurricane Andrew. 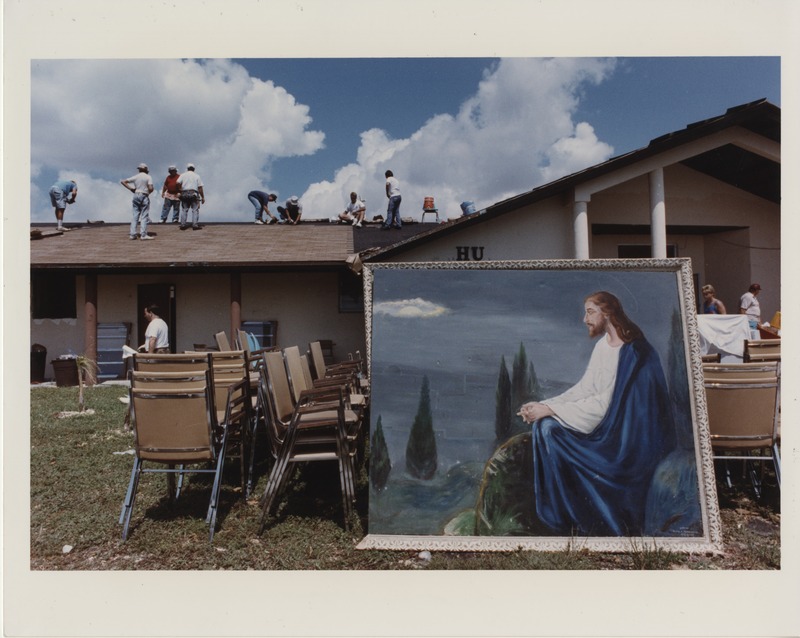 1992- LABOR OF LOVE: Volunteers from all over help repair the roof of Homestead Church of God in preparation for the next day's services. Many churches were damaged by the storm. 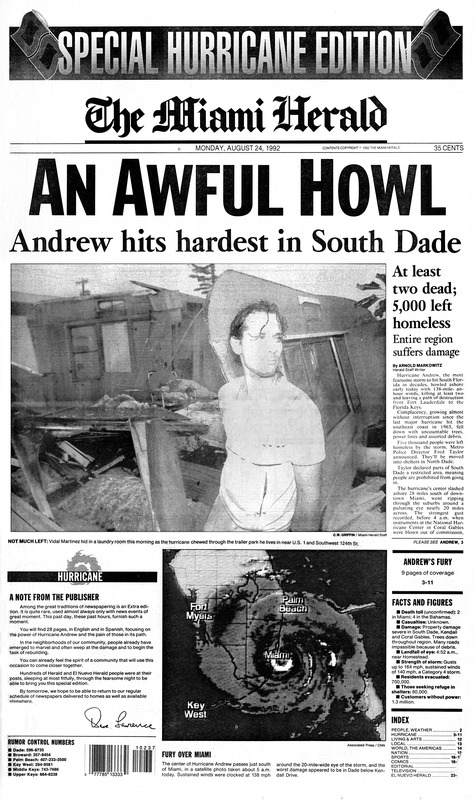 8/1992, Al Diaz/Miami Herald: Destruction at Dinner Key Marina caused by Hurricane Andrew. 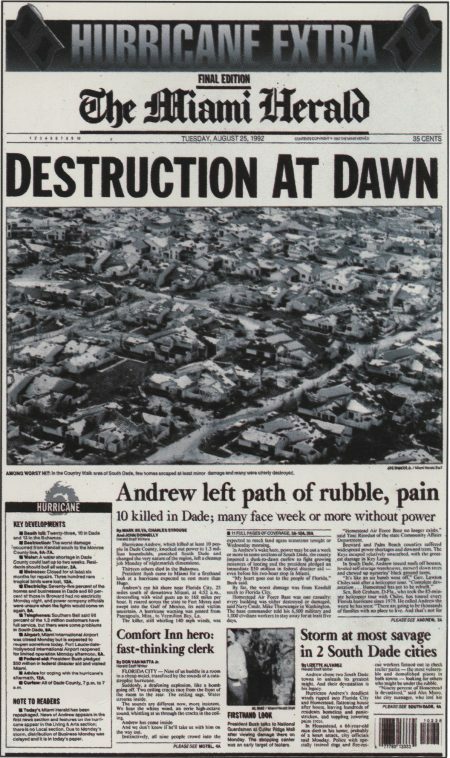 Cover page (page 1 section letter A) of the SPECIAL HURRICANE edition of The Miami Herald issue published Monday, August 24, 1992 in Miami, Florida. Features THE BIG ONE. Includes other Miami Herald front pages of August 24 to August 31, 1992. 1992- WATERLOGGED, Guardsman Todd Bryant talks with Jermain Mitchell, 11, as rain soaks a distribution center in Florida City. 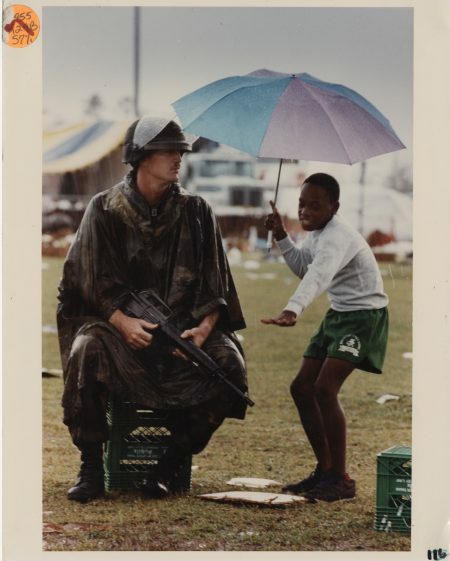 After a while, National Guardsmen and Army soldiers become as commonplace as police officers. 8/1992, Charles Trainor Jr./Miami Herald: Mark Futch sits listening to his radio on Southwest 6th Avenue in Homestead. The town of 25,000 saw 80 percent of its homes destroyed. What had once been a quiet farm-oriented community on the edges of an urban megalopolis had become a scene of unrelenting ruin. 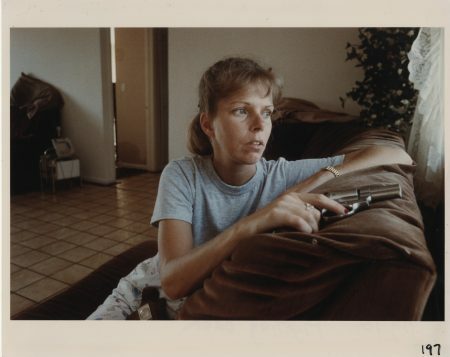 1992- FIGHTING BACK, Loretta Landrum, holding a .357 Magnum with hollow point bullets, takes turns with her husband guarding their Perrine home while they wait for the insurance adjuster to arrive. 8/1992, Jeffrey Salter/Miami Herald: In Little Havana, a person stumbles through the early morning rain as Andrew departs. Most areas of the city of Miami, North Dade and Broward suffered only minor damage, with downed trees causing the greatest problems. 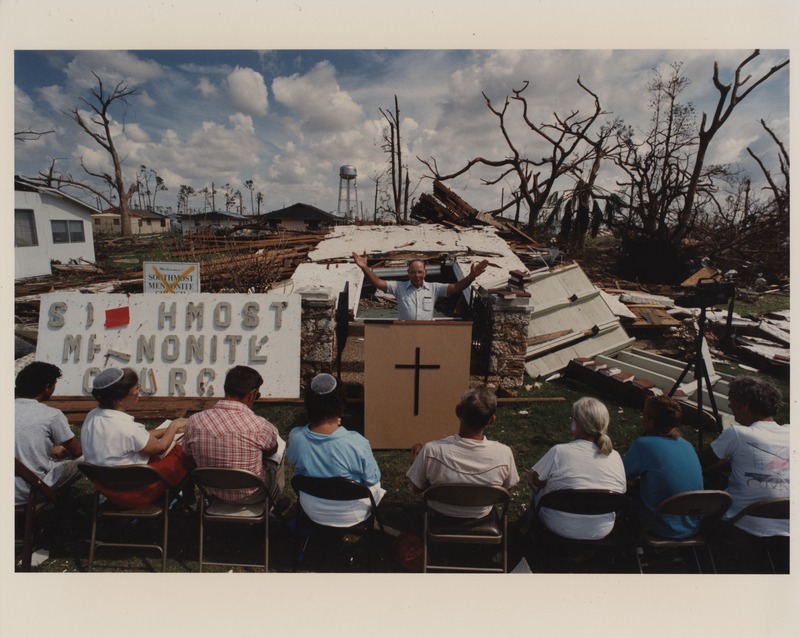 1992- GIVING THANKS: Pastor Leroy Sheats delivering a service in front of the remains of Southmost Mennonite Church in Florida City. 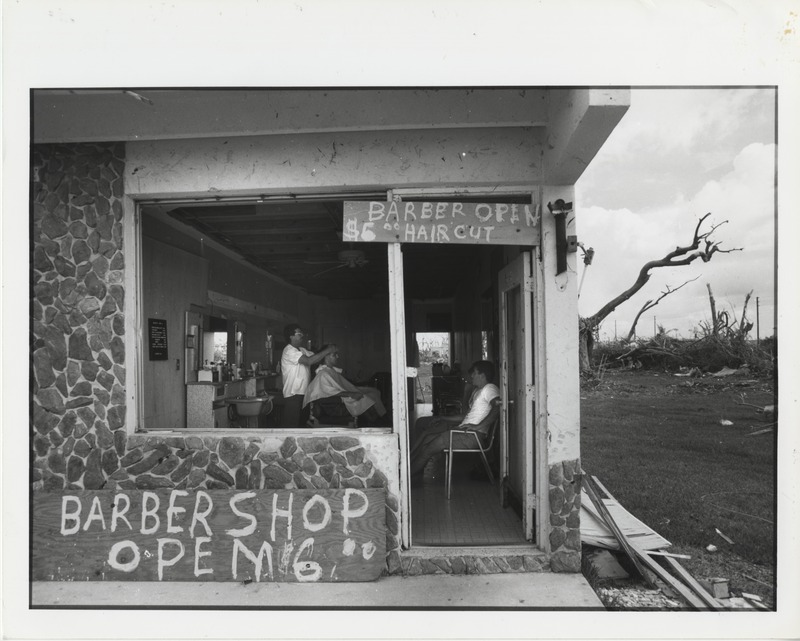 8/26/1992, Marsha Halper/Miami Herald: Juan Dominguez's Florida City Barber Shop is doing a steady business, despite no windows or power. Since it reopened on Wednesday. On Thursday Dominguez cuts the hair of Sgt. 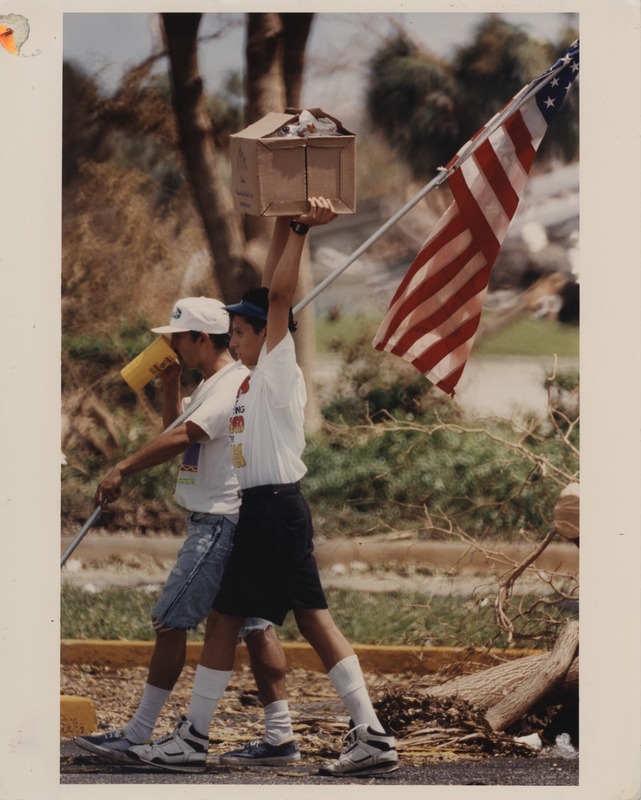 Miguel Alcover whise Fort Drum, New York Army Unit is working in South Dade. At right, Joshua Wilson of Florida City waits for his haircut. 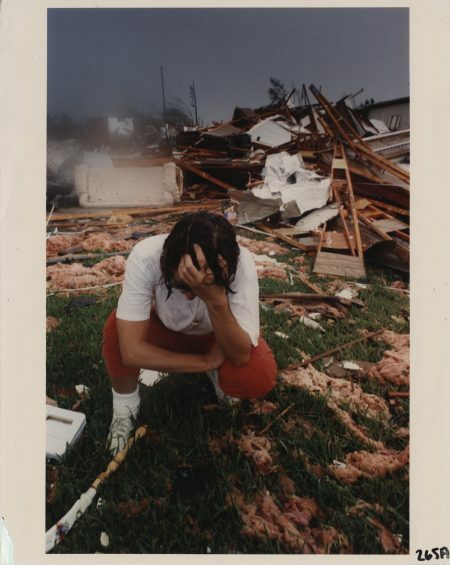 1992- STUNNED, Heidi Hentshel despairs at the destruction of her home at the Dadeland Mobile Home Park. 1992- GREENER PASTURES, A family of migrant workers heads out from the Everglades Labor Camp, on the way to Orlando. 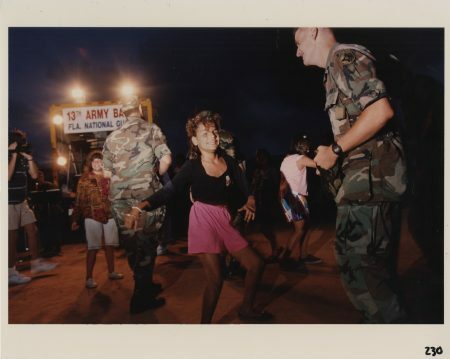 1992- UNWINDING: Shirley Camargo and Spec. 4 Walter Richter of the 13th Army Band of the North Miami National Guard dance to music being played by the other members of the band. Ten days after the storm, people were finally able to relax a little. 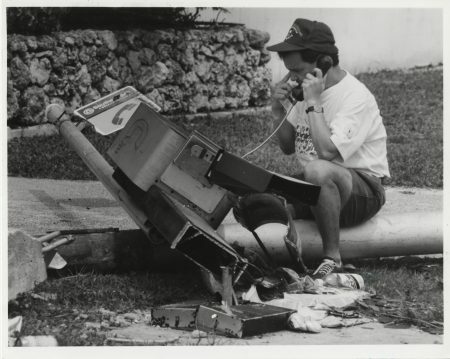 8/27/1992, Al Diaz/Miami Herald: Javier Erazo trying to call family in Honduras and Guatemala. 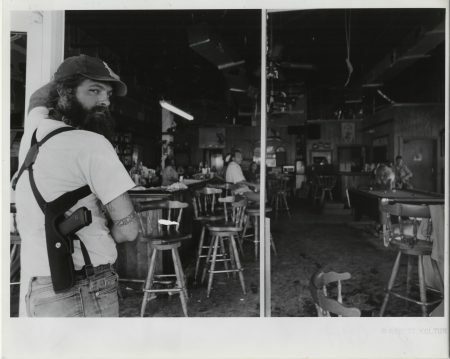 Tad Verret, owner of the Blarney Stone Tavern, watching his business from future looters. 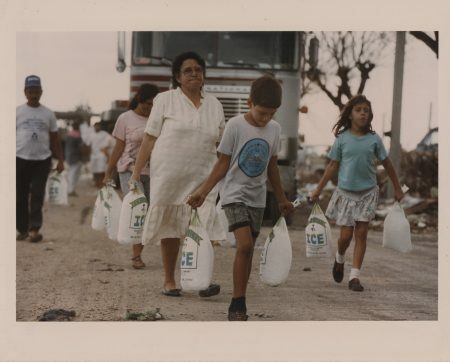 1992- CHILLED, Residents come away from a relief station with cool comfort. 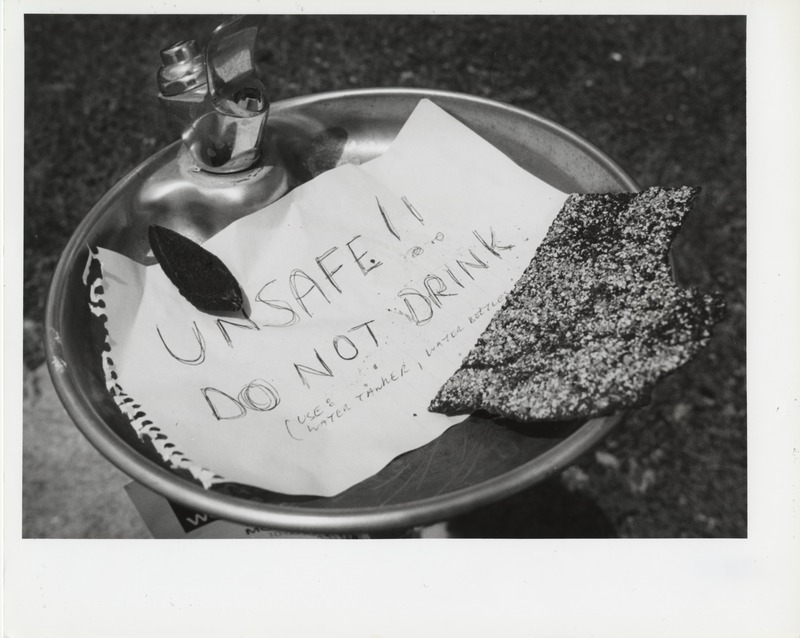 Without electricity for refrigerators or air conditioning, ice became uncommonly valuable. 9/2/1992, Beth Keiser - A simple sign warns people not to drink the water fountain at Harris field in Homestead. 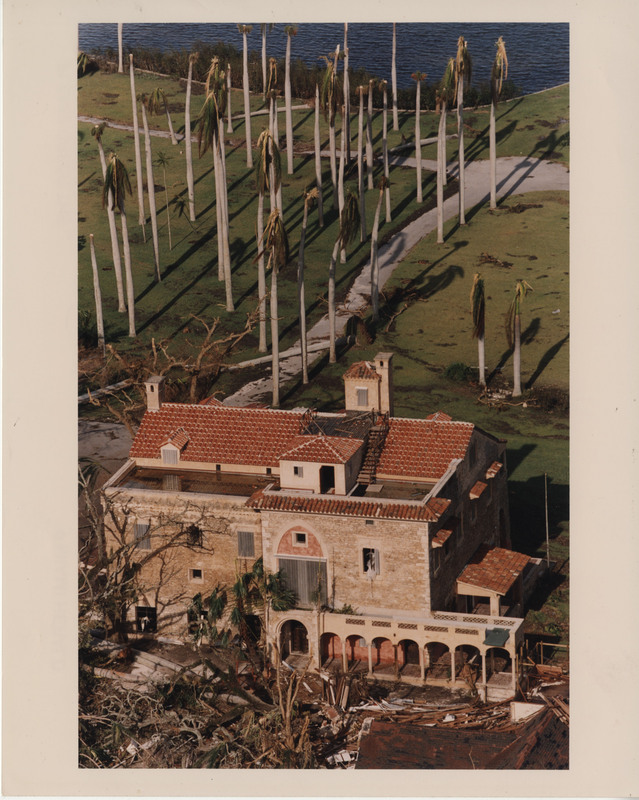 8/1992, Chuck Fadely/Miami Herald: The historic Deering Estate, facing the bay off Old Cutler, was hit hard, and the stand of royal palms, which often appeared on Miami Vice, was flattened. 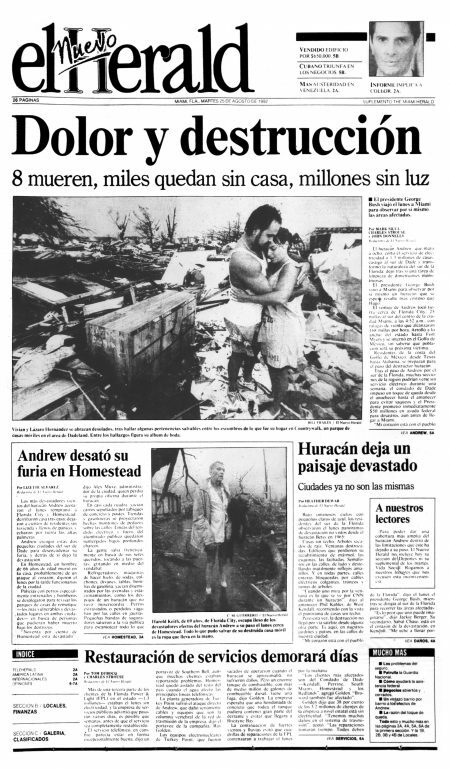 Copyright © Copyright El Nuevo Herald [Front;Hurricane Andrew - Dade;Buildings - Business] El primer negocio Latino abrió sus puertas otra vez en Homestead. 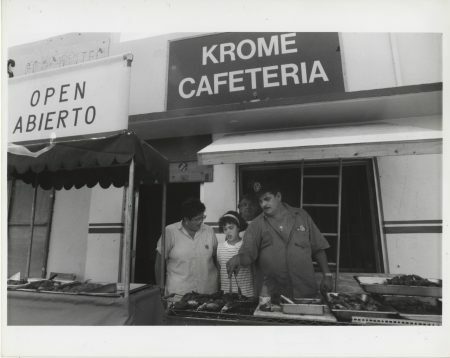 La cafeteria de Many García a pesar de haber sido dañada por la fuerza del Huracán Andrew fur reparada y en plena calle many con la ayuda de su esposa e hija procedió a instalar una barbacoa y clientes no le faltaron el primer día. Con actos como este se inicia la verdadera reconstrucción de lo destruido con el huracán en Homestead. 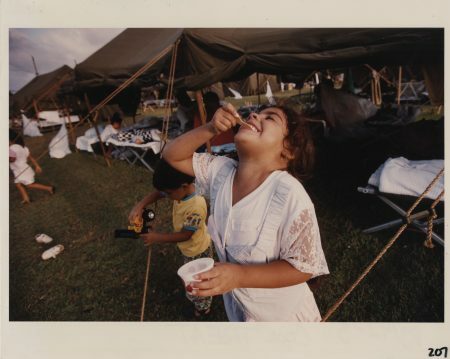 1992- COOL TREAT: Rosalind Vicenty, 5, enjoys cooling ice cream at Harris Field. After a few days, people began settling in to the tent city, and federal authorities were uncertain how long the tents would have to remain. 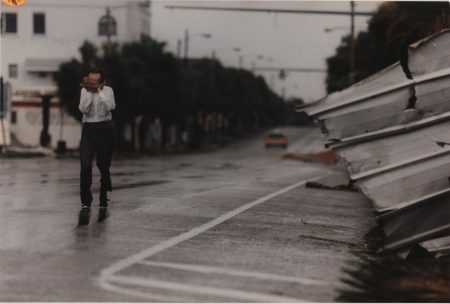 8/1992, Peter Andrew Bosch/Miami Herald: Minutes after Andrew passed, Margarita Llano still can't believe that the winds could be so powerful that they ripped a wall off her South Dade house. She was clutching her son Enrique, 4, and a relative, Elizabeth Castro, also 4. 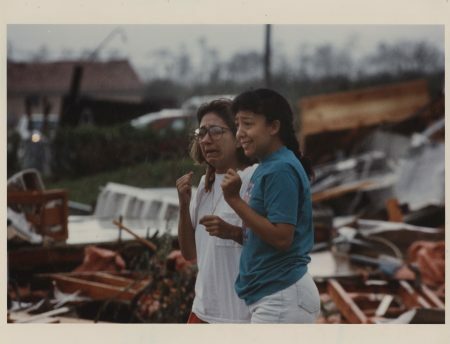 More than a dozen people had sought refuge with her before the storm, imagining her house near Country Walk was in a safe location. 1992- TIPPED, Mark Futch sits listening to his radio on Southwest 6th Avenue in Homestead. 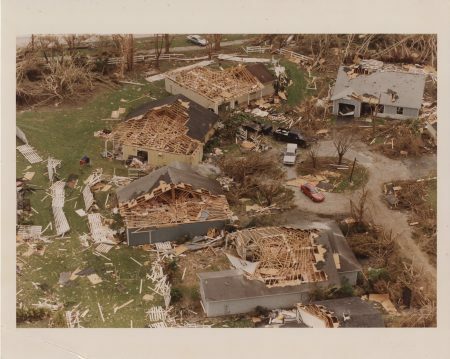 The town of 25,000 saw 80 percent of its homes destroyed. 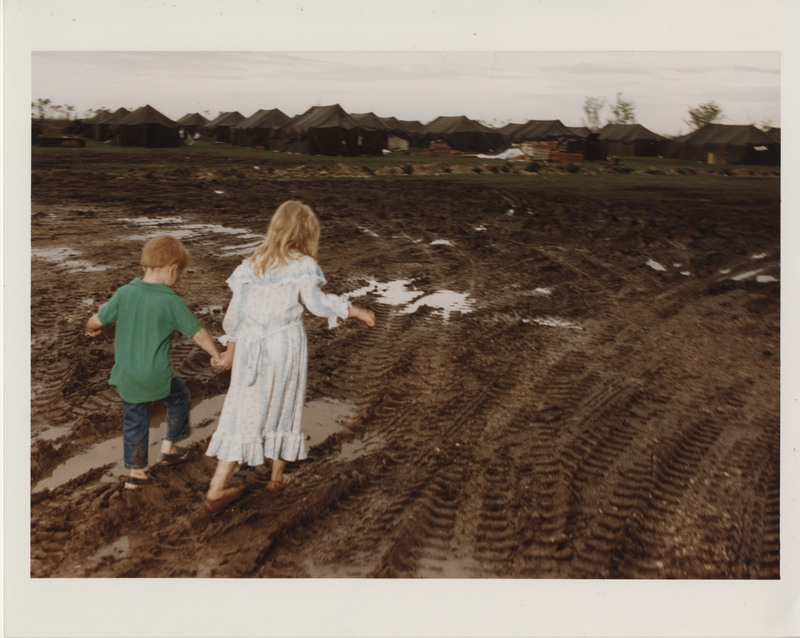 What had once been a quiet farm-oriented community on the edges of an urban megalopolis had become a scene of unrelenting ruin. 8/24/1992, Joe Rimkus Jr./Miami Herald: Aerial view of destruction caused by Hurricane Andrew. 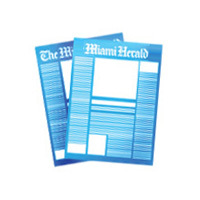 Cover page (page 1 section letter A) of El Nuevo Herald Herald issue published Wednesday, August 25, 1992 in Miami, Florida. PAIN AND DESTRUCTION; 8 DIE, THOUSANDS ARE HOMELESS, MILLIONS WITHOUT POWER. 1992- PRAYER, Doyle Green, 74, who has lived on a houseboat near the Card Sound Bridge for three decades, gives his personal assesment of what the storm meant. Many other people were thinking: "There but for the grace of God go I". Nicolao Fuentes, 13, carries supplies away from a releif center at the Cutler Ridge Mall while his father Antonio marches patriotically along. 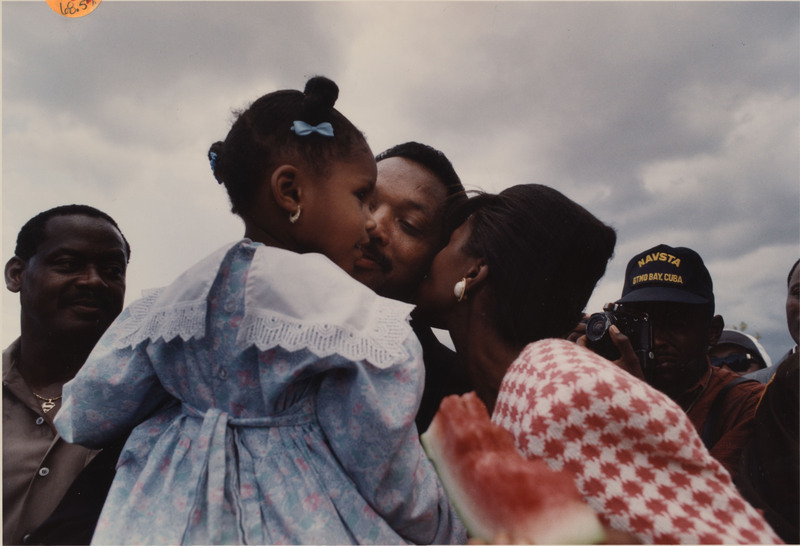 9/1992, Marice Cohn Band/Miami Herald: The reverend Jesse Jackson visits South Dade and tells people to stand tough: "It's easy to get blown down the road by a strong tail wind. 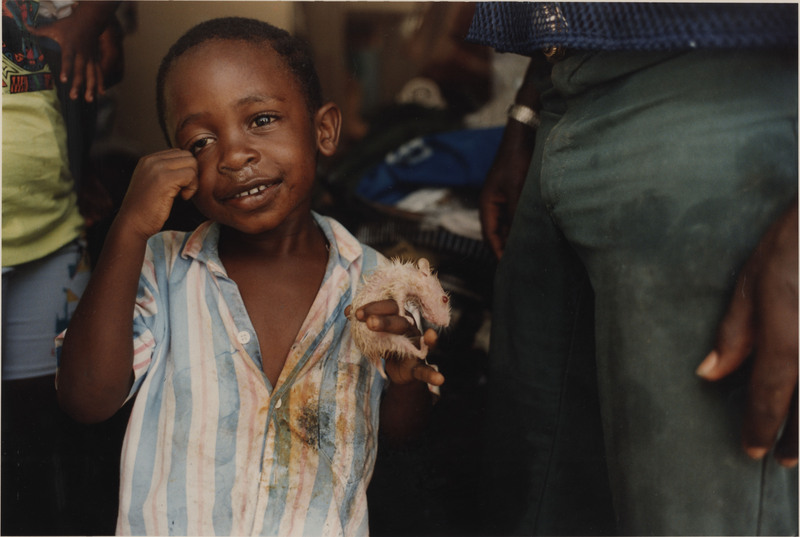 But your character is measured when you face life's head winds." 8/1992, Chuck Fadely/Miami Herald: Residents returned to the Saga Bay Apartment complex, at 212th Street and Biscayne Bay, to find soggy furniture and no windows. 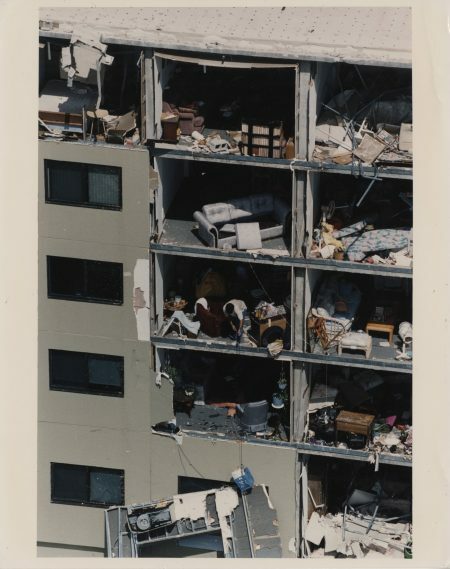 A resident lowers his belongings to the street below. The American Red Cross estimates that 9,140 apartments were destroyed, along with 8,140 homes and 8,230 mobile homes. 8/1992, Peter Andrew Bosch/Miami Herald: Heidi Hentshel, left, and Pilar Carrasco are overwhelmed by what they see at their South Dade trailer park. 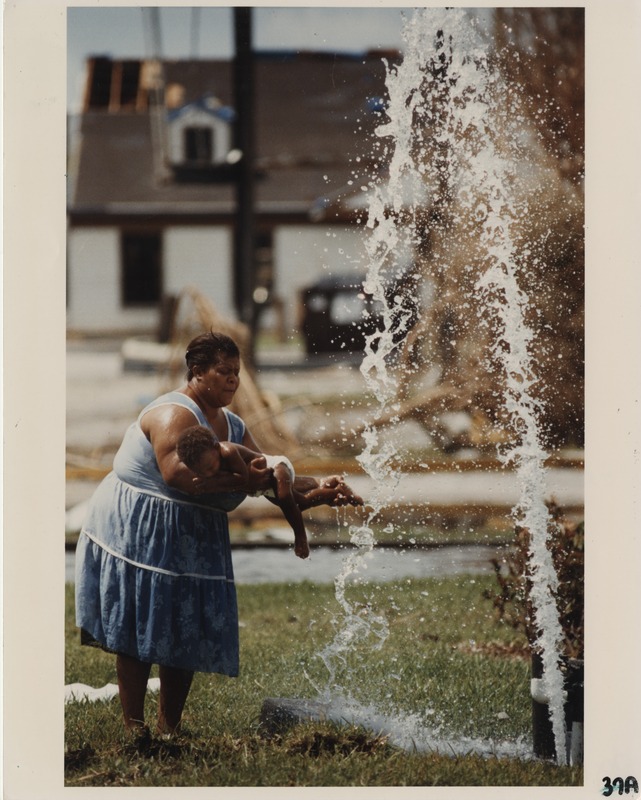 1992- QUICK SHOWER: Kathy Harvey washes her 19-month-old son Malkarska in the spray of a broken water main at U.S. 1 and Southwest 172nd Street after a ling walk from her Goulds home. 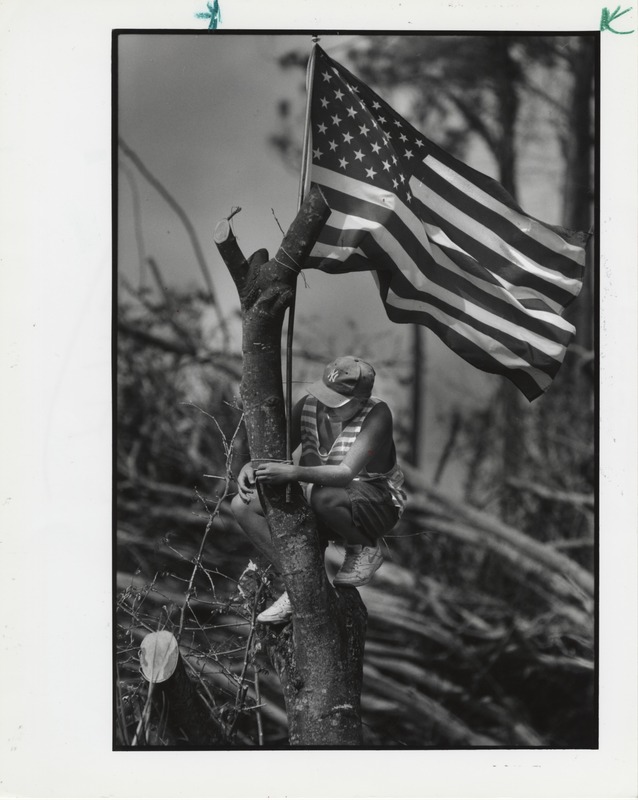 9/4/1992: Candace Barbot/Miami Herald Staff -- After having cleared the tree debris from his front yard, 14-year-old Chris Schere erects his personal symbol of "hope" at his South Dade home, high in a trimmed tree. 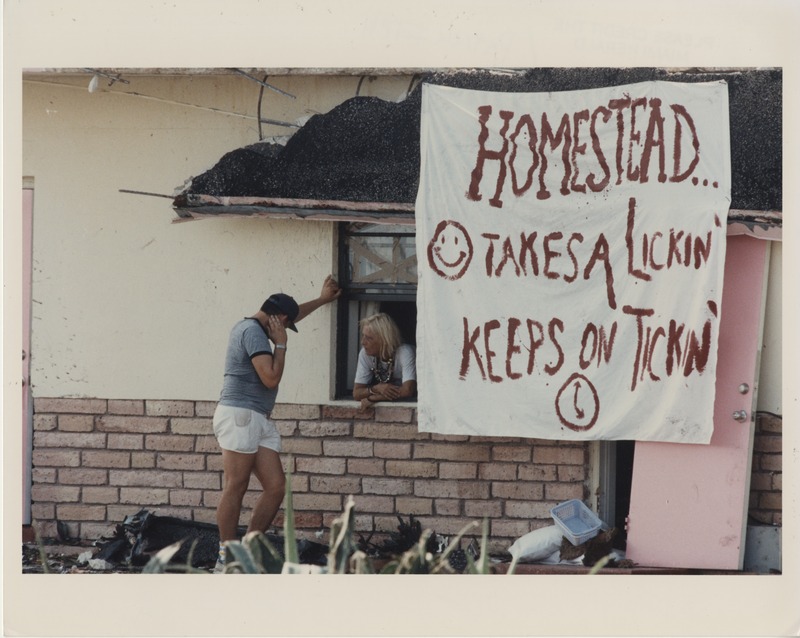 1992, Patrick Farrell/Miami Herald: "Homestead takes a lickin', keeps on tickin'." 8/1992, Joe Rimkus Jr./Miami Herald: In Homestead, exotic Australian pines look like they had been mowed down. 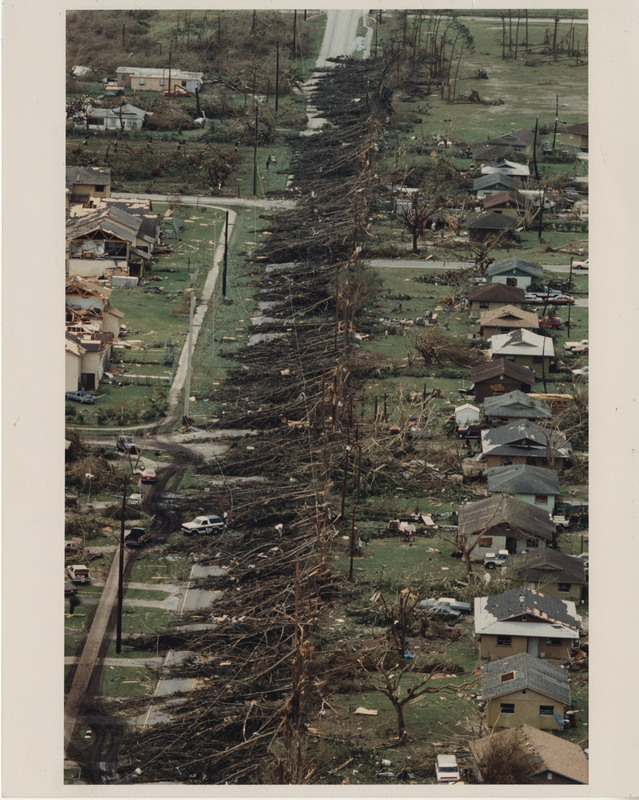 So many trees were damaged that one expert said it would take nurseries a decade to replace the lost foliage. 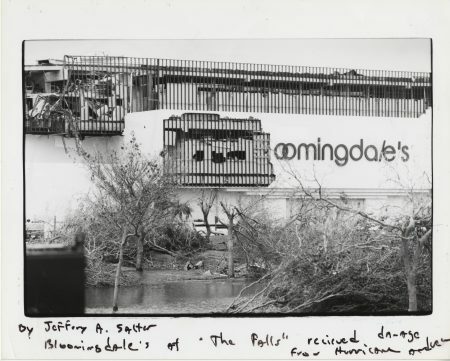 9/1992, Bill Frakes/Miami Herald: Kenneth Dykes looks around the place where he used to live: The Dadeland Mobile Home Park. The trailer that his father had reconstructed was no longer habitable. 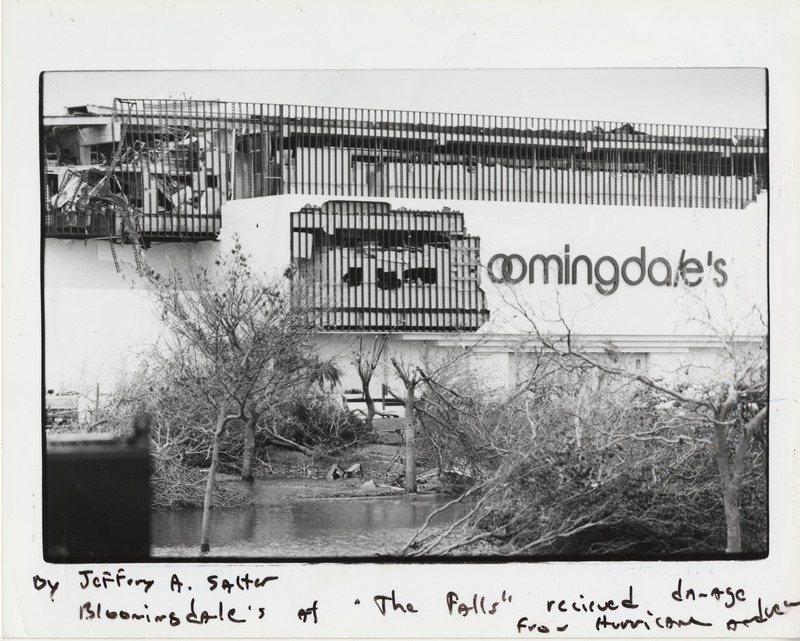 The park, located near Country Walk, was one of the places hit hardest by the storm. 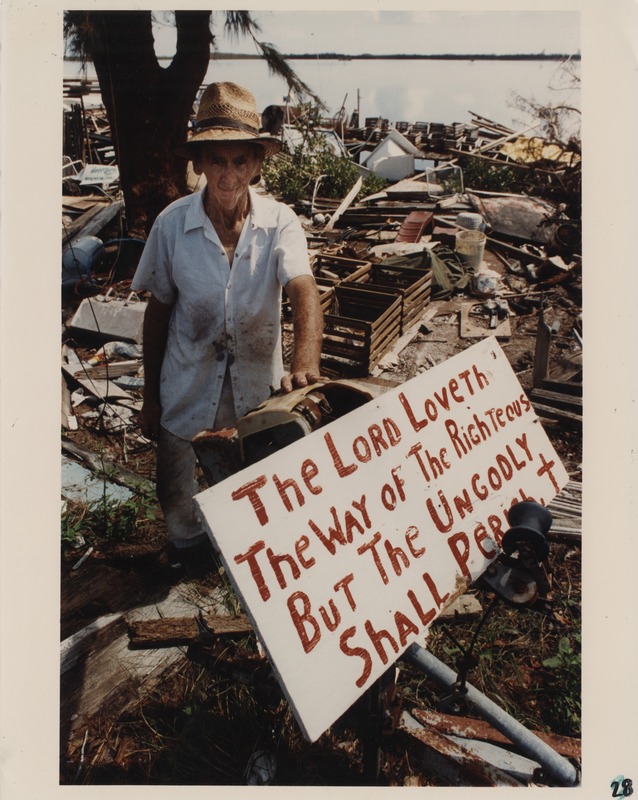 8/1992, Charles Trainor Jr./Miami Herald: Many people stop by to ask this fellow about Grandma Newton, who ran a well known bed-and-breakfast place across the street. When people saw her place was demolished, they went across the street to ask about her. Finally, the fellow decided it would be simpler to erect this sign. 8/1992, Bill Frakes/Miami Herald: From the air, County Walk looks like it had been hit by a nuclear weapon. 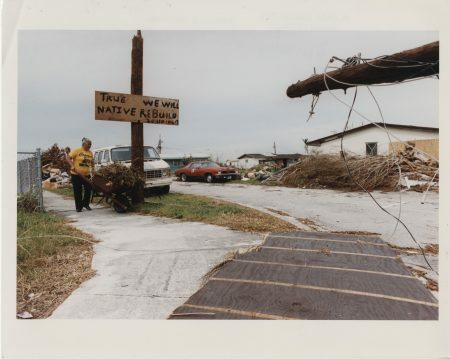 Perhaps 90 percent of the community's 1,700 homes were destroyed, and some residents filed suit against the developer, charging that shoddy construction was to blame. 8/1992, Chuck Fadely/Miami Herald: So many helicopters --filled with government officials, supply teams and news photographers-- were whirling around South Dade that some residents developed a new creative medium: roof art. Some people were able to keep their sense of humor --at least for a while. 8/1992, Al Diaz/Miami Herald: Democratic candidate Bill Clinton first said he didn't want to rush to Dade because it would seem like political opportunism, but several days later, he arrived. 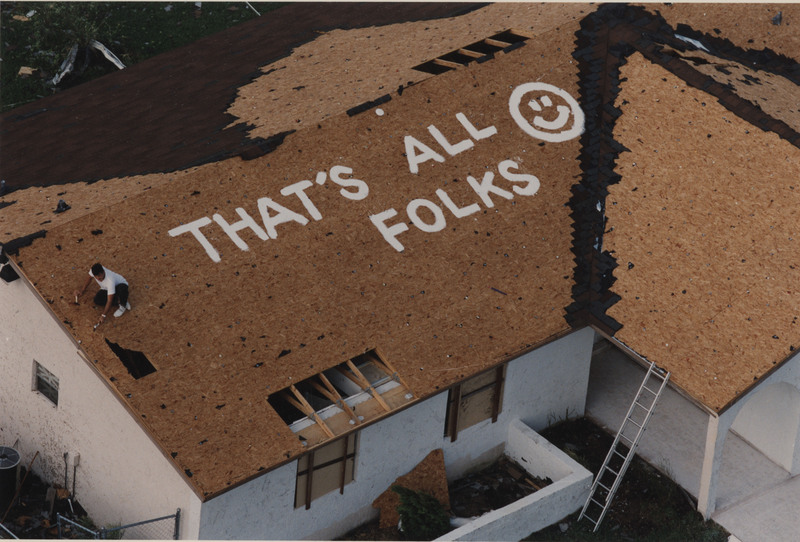 In an election year, it was inevitable that the disaster and politics would mix. 8/30/1992, C.M. 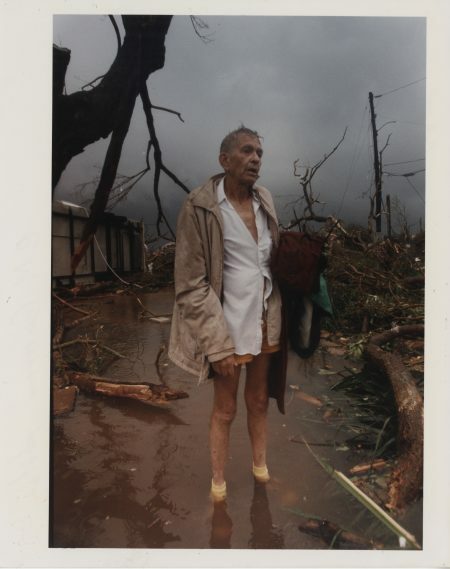 Guerrero/El Nuevo Herald: Harold Keith, 69, returning to his Florida City trailer park to find his home flatteened. 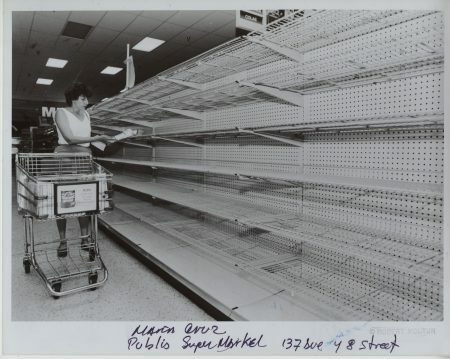 8/27/1992, Roberto Koltun/El Nuevo Herald: Maria Cruz at Publix Supermarket in 137th Ave and 8th St.
8/25/1992: Jeffrey A. Salter/Miami Herald: Bloomingdale's at "The Falls" received damage from Hurricane Andrew. 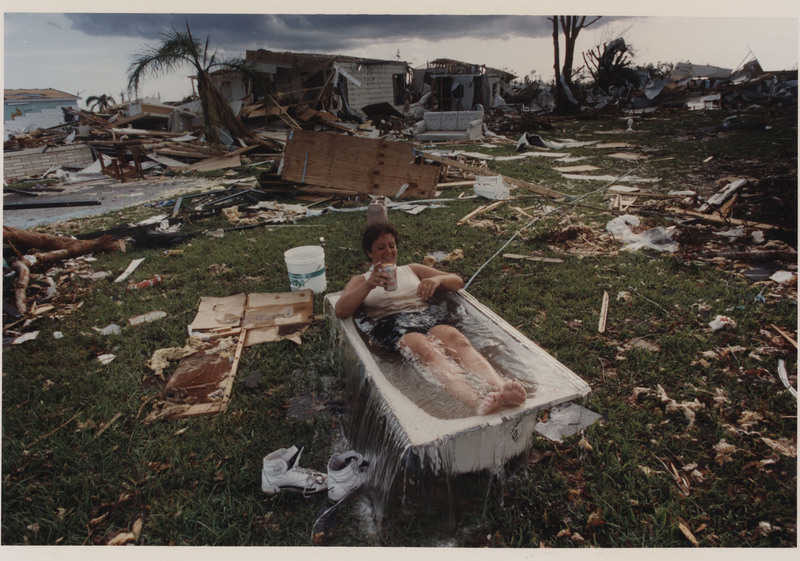 8/1992, Jon Kral/Miami Herald: On the seventh day after the storm, thunderstorms sweep through South Dade, once again drenching furniture in exposed houses and leaving many people mired in mud. 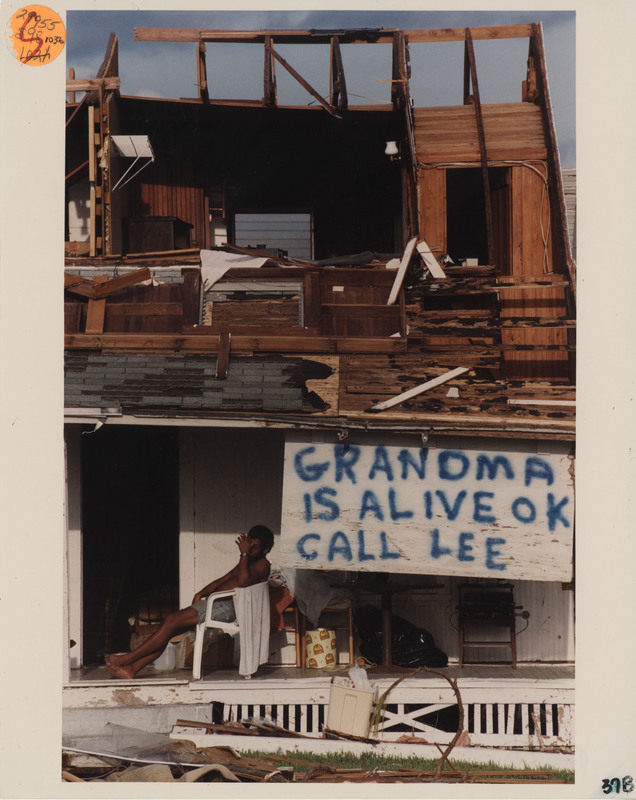 This stark scene, near the Homestead city hall, shows graphically the devastation the city suffered. 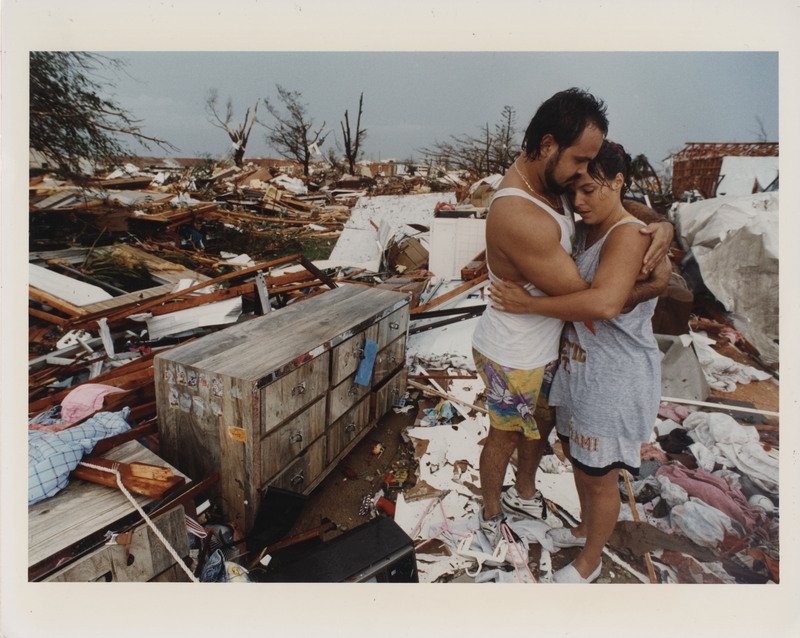 8/1992, Bill Frakes, Miami Herald: Lazaro and Vivian Hernández hug after finding wedding photos and a few other mementos scattered among the ruins of their mobile home near Country Walk. 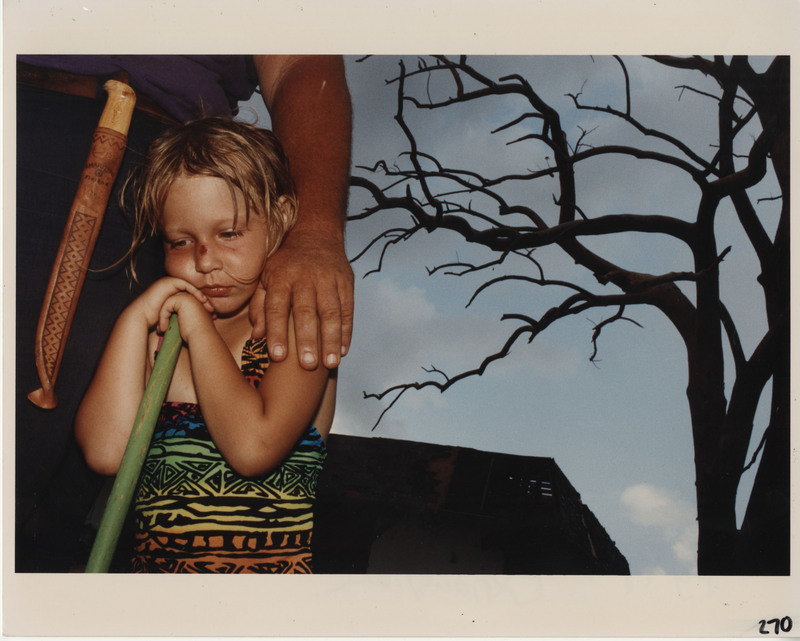 9/1992, jon Kral/Miami Herald: Crystal Siwik, 8, walks with her little brother, Eddie, 4, back to the tent where they are staying in Homestead. 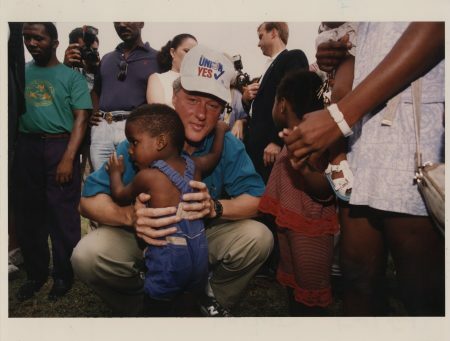 8/1992, C.W. 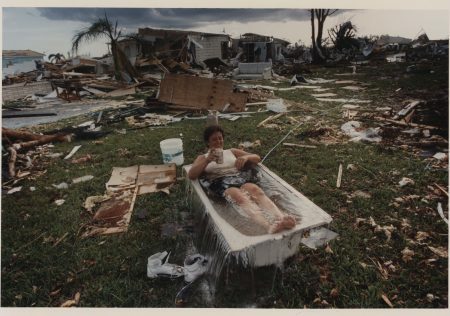 Griffin/Miami Herald: Marjorie Conklin, 40, cools down in a bathtub that her brother dragged from the remains of her mobile home in Florida City.